Say hello to Burton, isn't he adorable? 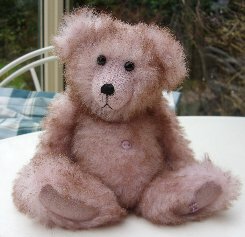 He is 7" tall and is made of lovely pale pink German alpaca, tipped in pale brown. The fur is very soft and very dense, adding to Burton's cuddliness. He is steel shot, glass bead and steel ball filled so is nice and heavy for his size. He is also loose jointed with a wobble head joint which adds to his charm. We have used very pale dusky pink ultrasuede for his pads and paws, he has a black stitched nose and shiny black German glass eyes with a twinkle of mischief in them. I love this little bear, he is in a style that we introduced last year and we really enjoy making them. 7" is just a little bigger, but not too big that space is a problem. I do hope that you like him too, he costs £56.50 plus postage. Please note that as with all our bears, Burton is not a toy and is not suitable for children. Sorry - Burton has been adopted.